Score Alice In Chains Tickets This Week With Bahan On The Morning X! Ready for Spring, X Rockers? Hell yes! Bring the warmer weather, and let’s tee up more amazing Rock shows for the River City! 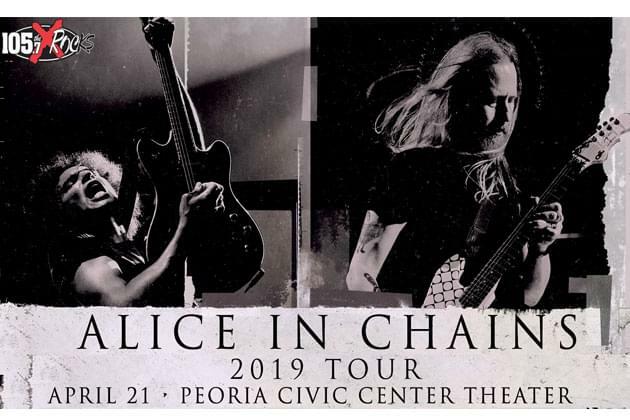 This week on the Morning X during the 8am “Listen And Win” hour, YOU can win a pair of FREE tickets for ALICE IN CHAINS, as they invade the Peoria Civic Center Theater on April 21st! Tickets are on sale now, and they are almost all gone! Get them today at the Toyota Box Office at the PCC, or just click “ticketmaster.com.” Wanna win them for free? Hell yes you do, listen with me all week, and they just might be yours! Big thanks to the Peoria Civic Center! Tickets provided by National Concerts 2!